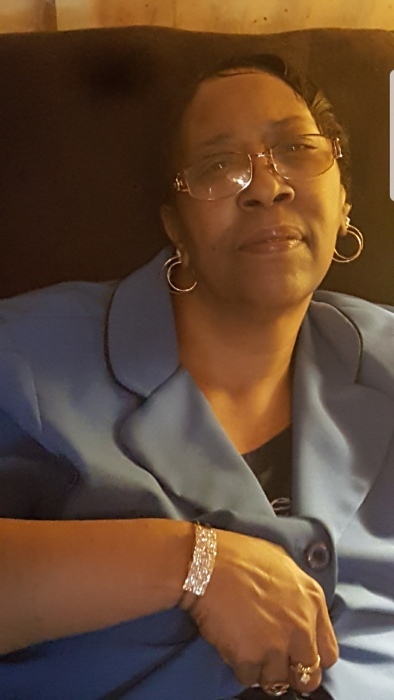 Barbara Williams, a native and lifelong resident of Grove Hill, AL., departed this life on February 4, 2019 at Providence Hospital Mobile, AL. She was born on November 20, 1960 to the parentage of the late Allen Presnall and Eleanor Martin Presnall. She is preceded in death by her parents and sister Elaine Davis. At an early age she confessed Christ as her Lord and Savior and joined MT. Zion #2 Baptist Church. She later joined Orange Hill Missionary Baptist Church. She will be cherished in the hearts of her family, a loving and devoted husband, John Williams, Sr., of Grove Hill, AL., two faithful children, John (Pamela) Williams Jr., of Grove Hill, AL., Ursula (Issac) Welch of Fulton, AL., two sisters, Annette (LaDredge) Madison, Grove Hill, AL., Emma Marie Love of Birmingham, AL., three brothers; Clausell (Venessa) Stallworth, Compton, CA., Wendell (Kristie) Presnall of Grove Hill, AL., Steven Foreman, Whatley, AL., five devoted grandchildren; Aniya Welch, Destiny Welch, Issac Welch III, Toya Williams, Tyra Williams and one great grandchild Cassi Cade and one devoted uncle Walter Martin and a host of sisters-in-laws, brothers-in-laws, nieces, nephews, cousins and friends.